So let's have a discussion and find a solution in this thread. 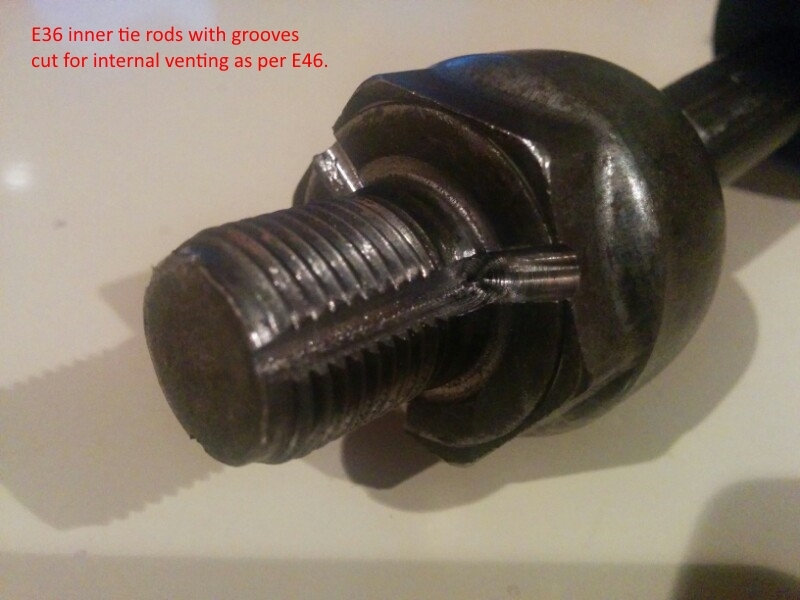 Can the E46 inner tie rods be used? On the E30? On the E36? With which other parts? With which mods? Etc. Not really the biggest problem in the world, a lot of ways to fix it. Interesting to know they are different though. ^ please list the lot of ways for us all to benefit? Run an E46 rack in the E36ti race car, no problems at all. Have full E46 front end actually, rack, struts, arms, brakes. Stocks do the bush for the A arm fitting to the E36 lollipop. Gives me about 4 degrees of camber. A lot of info about your setup but I'm not sure you addressed the question? An interesting issue and not immediately obvious. I had a look at my spare e36 rack and noted the bypass tube. This could be recreated on an e46 rack I'm sure with relative ease using carefully placed drilled and tapped hose fittings much like that of an e36. Elaborate and over complicated. 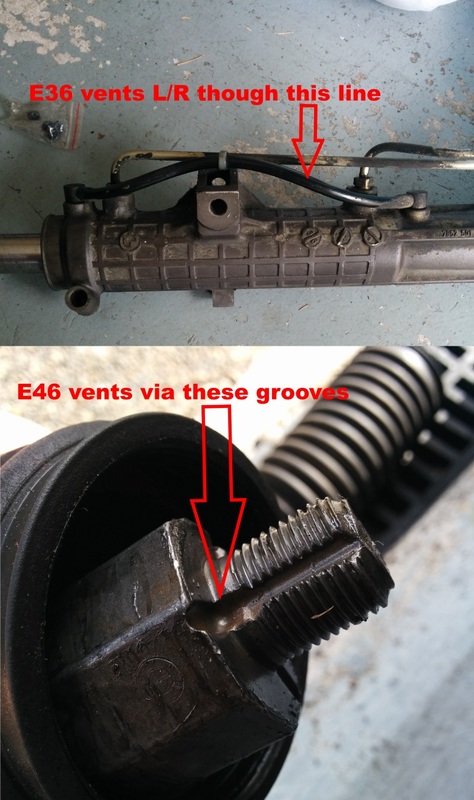 The megawebnet suggests that the e46 inner is grooved along the thread to allow air to flow to the rack center. This could be recreated on the e36 inner. Difficult to do and would require attention to remaining thread engagement. 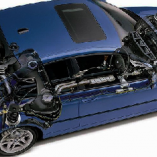 The web also suggests the e46 inner fits and is recommend for this very issue. I would start here by either buying or borrowing an inner to compare fitment. Those would be my 3 possible solutions. I have a set of E46 inners here that you can come and grab to trial with your E36 outers. I dont think they work to be honest, I have a feeling the E36 outers are too long (similar length to an E30). I would have gone and grabbed some but Gavin was away, I did eyeball them when I was there though and they did look the same length as E30 just with the threads reversed. I have done the same as you and put a small slit in the *brand new* boots for now and to be fair on a race car they should be fine. I would be keen to find a more permanent solution though. If it comes down to it you could easily drill into the rack and put a couple of barb fittings and some hose in to equalise the pressures in the boots. Thanks dude, I might take you up on that offer if I can't get mine un-seized. So many conflicting opinions I just have to try for myself now! I want to avoid buying a whole lot of new parts if possible. Yeah, even with the holes they're not venting perfectly but it's 'good enough' for now - although I'll want a permanent solution within the next month or so. I'll keep posting my findings back here. Yeah well pretty much the only mod you could do without spending any money would be to try e46 Inners with e36 outers. If you have a spare set of e36 ones bring em over, I have no engine in the car and can get rack in and out easily. My local machine shop said it will be a trivial exercise to cut grooves into my soon to arrive E36 tierods. I'll get these fitted by SJ next week and see how they go. Edit: cost me $40 for the shop work. Could you explain why the need to mix and match the parts and not just fit a e46 rack complete?. Still don't get it so they are longer are you running some tie in/out special set up or wide body ??? I'm using E36 tierods in an E36. I can't use E46 ones because they're longer, the E46 has a wider track. Nice work mate! Very keen to see how these go for you. To be fair I probably still won't change mine as they are brand new, but if/when I bend one I think I'll go for it, cheap enough. I just used e46 inners with e36 outers worked no problem. Yes, if you have all of the bits in good order then you can make it work just as you have. That combo is a little longer but I doubt that matters much. 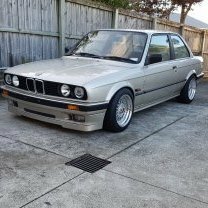 Bumping a 4 yr old thread, but just wondering if people here have had their rack swaps to E30s certed. My cert guy wants to know if the dimensions of the Z3 rack are the same as the E30 rack (pretty sure Z3 is wider?) or alternatively if there has been a precedent set in NZ with this rack conversion. Did anyone have to get an engineers report? @WYZEUPshould be able to comment on this regarding the cert, as it's not really about the dimensions, it's about spacing of the rack within the front subframe, and bump steer. While my car had the e36 rack in it, and did mention it to my certifier, it doesn't appear to be logged in my cert documentation. And as for the e46 rack in the e30, I'll be doing this myself shortly (currently have e36 rack), but the consensus seems to be e46 inners, e36 outers. I have the purple tag rack certified in my E36, I just had to bring a OE E36 rack for the cert guy to compare it with, no bump steer test required. Cheers guys. I guess that's the problem with cert's, it all depends on who is the inspector. I assume his concern is that with a rack that is longer/shorter the fulcrum is now at a different point than oem. The inner rack end ball joint piece will now be closer to the hub. IIRC e36, Z3 and e46 racks have slightly longer range than the e30 rack (millimetres) ... all that'll really do it's eventually destroy your guard liners if the tyres rub. Easily sorted with rack stops if it were an issue. I've never heard of a cert being required for an OEM rack swap. Accepted that this could be simply because it's difficult to notice. I wouldn't bother pointing it out - the e36, Z3, e46 swap into an e30 is tried, tested and well proven to work without issue. Unfortunately I was too honest (also didn't think it'd be of concern) and have already told him. I'll keep everyone informed of how I go in case it's of any interest to anyone. poor advise. very easy to balls up. as you say, can make the wheels touch the body and fold up and under the car and through the firewall. or space the rack the wrong way in the subframe and you are turning every time you go over a bump. as for not telling them at all, its on your plate, and thus your insurance. it comes down to the rest of your suspension as well. the rack is only part of the picture, whats the rest of the setup. it is otherwise stock E30 suspension? is it the hideous E46/nonm3 E36 ballsup. is it E30 or E36 M3. etc. what rack has a precedent for what suspension setup is important. i have an E36 rack in mine (not Z3) and its all certed, but i do have E36 M3 front suspension.